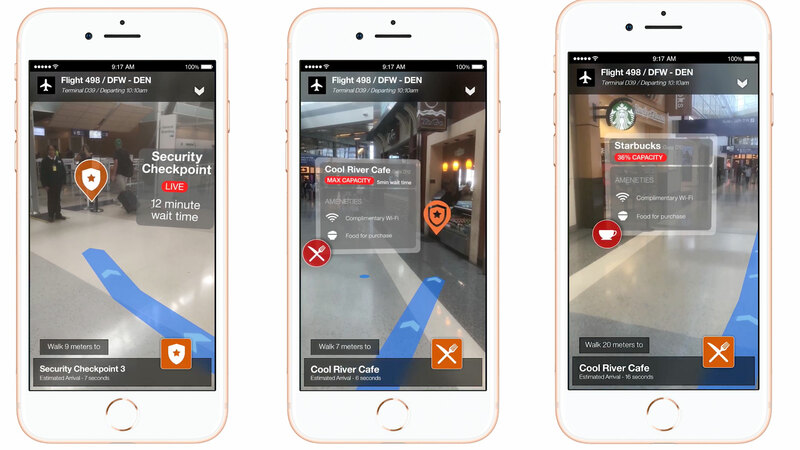 AR Consumer Journey: A Use Case demonstrating why Augmented Reality is a game changer. 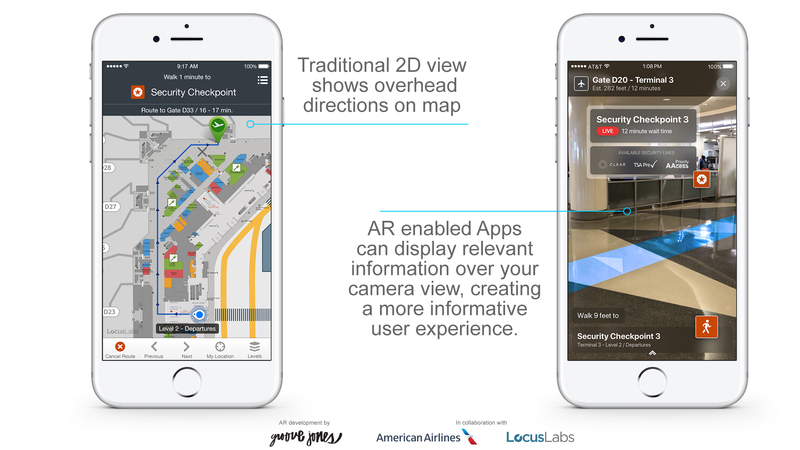 We recently had the opportunity to work with American Airlines and Locus Labs on developing an AR-enabled App using some of the new features available with Apple’s ARKit and Google’s ARCore. Groove Jones developed the AR in collaboration with American Airlines and Locus Labs. Walking through the technology implementation. Below we show how the App transitions from the traditional 2D map view in the AA App. The existing mapping technology is provided by Locus Labs. Location-based data can be provided to App based on what is available. The AA App can deliver this data and by using AR, we can display it on screen over your camera view. 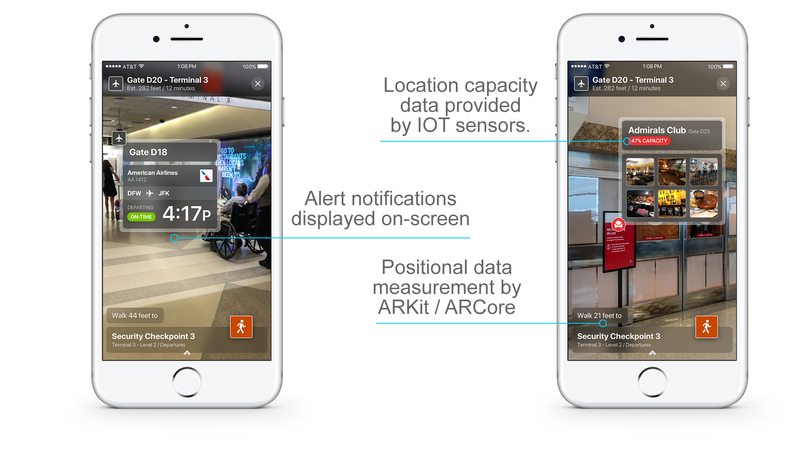 IOT sensors provide other data like wait times or capacity. Beta testing involved field testing onsite which we had to do at DFW airport. Below is a video we captured while we were actually traveling. This experience was shot on location at DFW Airport. A little bit about AR. Not to be outdone, on August 29th Google announced their SDK — ARCore, bringing a similar platform to Android devices later in the year. Our studio began working with these new technologies early in the beta program, testing the capabilities of the potential of going to market with some applications. In three years, Apple will have over 850,000,000 AR-enabled devices. That is roughly one device for every nine people on Earth today and nearly half of the current smartphone market. Analysts predict that Apple is currently ahead of the game with over 500,000,000 AR-enabled iPhones. Android users will launch with about 100,000,000 devices. Combined this is a vast audience. We appreciate all groups that were involved in this production. For more information or a demo, please visit www.groovejones.com or email info@groovejones.com.